The data window is used to display all incoming data from the hardware or simulators. The data window is integrated in the Hydromagic environment as a docked window. Invalid or missing data is displayed in red. When data has been received in the last three seconds and is valid, it will be displayed in green. By default, the data window is displayed as a docked tabbed window. If you want to show or hide this window, just select the "Navigation Data" option from the "View" menu. 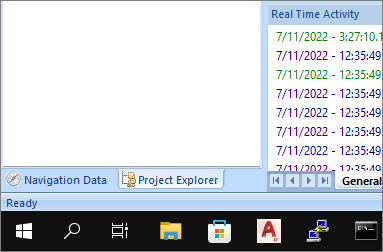 Sometimes the windows is already displayed, but as a tabbed window. You can easily modify the data window by showing and hiding items. By showing only the needed information, the display will become more well organized. 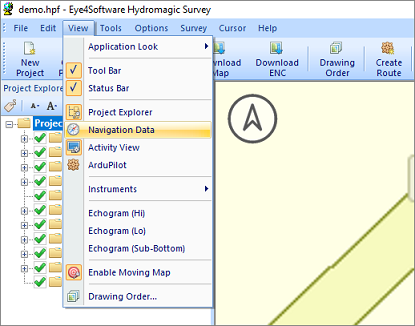 To select the items to display, right-click on the data window to show the following dialog. You can just select the items to display, by checking them. Your current GPS position in WGS84 latitude and longitude format (geographic coordinates). It is possible to change the display format used. The display format can be modified from in the "Units" tab in the preferences window ( "Preferences..." from the "Options" menu ). Your current GPS position in UTM (Universal Transverse Mercator). The UTM zone is automatically detected using your current position, and will also be displayed. The UTM coordinates are displayed in northing and easting meters. Your current GPS position displayed as easting and northing coordinates. This projection is the same as the projection displayed in the status bar at the bottom of the screen. Altitude of the GPS antenna. Depending on the GPS, this can be the altitude above sea level, or the altitude above the geoid. The altitude can be displayed in meters or feet. The current altitude unit setting can modified from in the "Units" tab in the preferences window ( "Preferences..." from the "Options" menu ). Displays both the low and high frequency (if applicable) depths returned by the echo sounder as well as the depths corrected with the current tide value. When the connected echo sounder does not have dual frequency capabilities, both the "Sounder Lo" and "Corrected Lo" values will remain invalid (red color). Displays the current tide value. Depending on the settings, either the manual, RTK or tide receiver tide will be displayed. Course calculated by the GPS. Also know as course over ground. When using a magnetic heading sensor like a compass, the magnetic heading will be displayed. Speed calculated by the GPS. Also known as speed over ground. The speed can be displayed in miles per hour, meters per second, knots and kilometers per hour. The current speed unit setting can be modified from the "Units" tab in the preferences window ( "Preferences..." from the "Options" menu ). This option can be selected to retrieve more information on the GPS fix. This section in the data window includes the quality of the GPS fix (no fix, GPS fix, DGPS fix, etc...), the number of satellites used and some basic information on the DGPS reference station used (not available when using EGNOS/WAAS). This option can be selected to enable the DOP (Dilution Of Precision) section in the data window. It shows PDOP (overall dilution of precision or position dilution of precision), HDOP (horizontal dilution of precision) and VDOP (vertical dilution of precision). Display motion information received from a motion sensor, IMU or echo sounder with built in motion or heave sensor. Enabling this option will display heave, roll and pitch information in the data view. 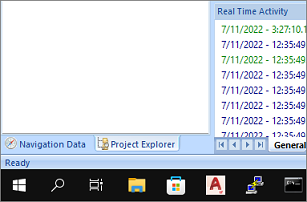 Just displays the current PC date and time in GMT (Greenwich Mean Time). When a sound velocity probe is used during the survey, the current speed of sound (sound velocity) will be displayed here. When the selected vertical units are feets, the speed of sound will be displayed in feets per second, otherwise in meters per second.